The rumors about the side loading being favorable for running pirated apps have been denied saying that it is just for developers to share the beta versions. There had already been rumors that the BlackBerry Playbook tablet might drop the side-loading of Android Apps, but Research in Motion has clearly denied the rumors of any such move. The Vice President of RIM developer relations, Alec Saunders went on to cause a controversy yesterday, when he hit out at the “chaotic cesspool” of the Android apps market. Also, in a tweet he appeared to have suggested that in future RIM would prevent side-loading of Android apps on the BlackBerry PlayBook. Clarifying his misunderstood tweet, he posted on his blog, saying that the readers misunderstood him and that the support for Android apps on the BlackBerry Playbook OS and forthcoming Blackberry 10 operating system will remain in place. Side Loading on the PlayBook platform has been a change in the nature of the tablet and that it is a developer feature which exists so that the developers can load their applications onto their devices for testing purposes, added Alec. Saunders had tweeted regarding a small survey of 75 Android app developers, which clearly showed that about 53% of them viewed app piracy as somewhat a huge problem. He further cited instances of the developers apparently side-loading the free Android apps on to the PlayBook that were made by other companies. Saunders claimed that the side loading is a feature which helps developers sends out Beta releases to the testing community for reviews and not for the users to load on the pirated apps. In a recent blog post, Alec revealed about the next release of the PlayBook OS, which would include a feature that could encrypt apps so that they can only be run by users who have purchased the app, thereby putting an end to piracy apps running on the tab. The Canadian firm is working with the developer community to ensure that they can quickly and easily test their apps on real hardware. Also, anyone attending the BlackBerry 10 jam will be given a prototype device to start building on. RIM has been trying hard to revive the fortunes of the Playbook tablet, which has not been successful in igniting the interest of the consumers since its launching in April 2011. 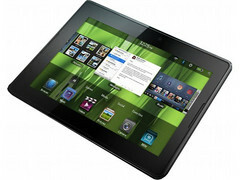 The introduction of the new Operating System has definitely improved the performance of the PlayBook. Since there have been 1.35 million sales of the BlackBerry PlayBook, it has been struggling to compete with the Apple iPad and other Android running popular devices. RIM was recently made to deny reports of it retreating from the Consumer market following a disastrous set of quarterly results, which had prompted the RIM co-founder, Jim Balsillie to have to leave the firm.